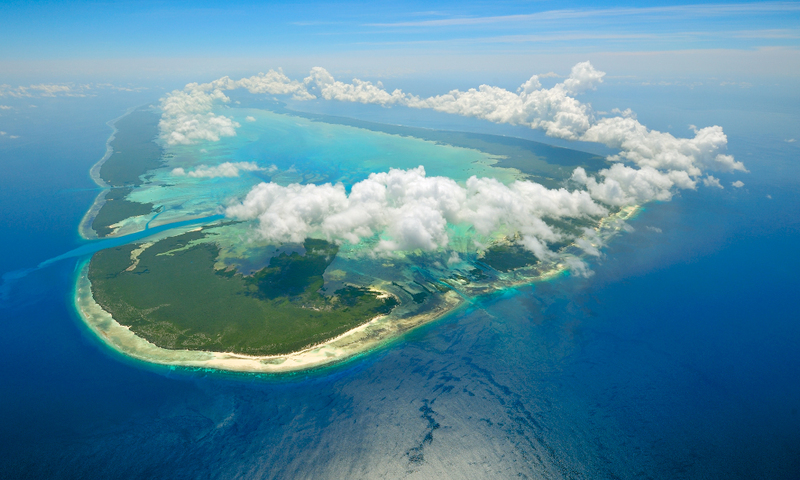 Aldabra is the world's second-largest coral atoll with an area of 150 square miles, including its lagoon. It is isolated from the nearest landmass (Africa) by hundreds of miles of open ocean. On Aldabra a ring of islands surrounds a central turquoise lagoon, the tidal heartbeat of the atoll, with millions of tonnes of water rushing in and out, twice every day. Aldabra’s geographical isolation, rough terrain and scarcity of fresh water have deterred large human populations from settling, which means that until now there has been minimal human influence over the atoll’s rich and diverse ecosystems. The atoll is home to the world’s largest population of giant tortoises, pristine coral reefs, endemic bird species, large colonies of seabirds and the largest population of nesting green turtles in the Western Indian Ocean. However, in spite of its remoteness and the absence of human habitation, Aldabra is not immune from the impacts of human activity. Over recent decades vast quantities of plastic waste have washed up on Aldabra’s coastline. This waste varies from domestic items such as flip-flops and toothbrushes to large equipment used in the fishing industry. The massive amount of plastic rubbish covering the coastline is too great for the Seychelles Island Foundation (SIF) – who manage the atoll – to tackle alone. Dr Lindsay Turnbull of Plant Sciences is on the board of trustees for SIF and her PhD student April Burt was previously the scientific coordinator on Aldabra. Together they have joined forces with The Queen’s College and SIF to launch this project that aims to clear Aldabra’s coastline of plastic waste. The project will unite a team of six Seychellois volunteers with six Oxford University students, who together will plan and carry out an intensive clean-up expedition. The team will charter a cargo vessel to Aldabra in March 2019 and stay on the atoll for between three and five weeks, gathering as much plastic and marine debris as possible. All of the plastic waste will be taken back to Mahé, Seychelles' largest island, for proper processing. Whilst undertaking the clean-up, the team will endeavour to analyse the waste to identify where the plastic has come from and quantify just how much the atoll is impacted by plastic pollution. The project is being launched with an event at the Royal Society on May 22nd. A short film highlighting the issue of plastic pollution on Aldabra will be shown and there will be speeches from project members, the Provost of Queen’s College and Sir Tim Smit (founder of the Eden Project and SIF trustee). In the lead up to, and following, the March expedition the teams will reach out to primary and secondary schools to engage and inspire young people with the story of Aldabra, encouraging them to minimise their use of plastic and highlighting other actions we can all take to protect Earth’s incredible diversity of life. The UK based team will also hold a variety of events across Oxford, both within the University and across the wider city, looking to encourage local communities to take action and cut down on their plastic use.